THE SPANISH GUERRILLAS in the north were not as numerous as their comrades in the south, but their presence was clearly felt in the battles of liberation that began in June 1944. In this theater, however, they were joined by their brothers who fought in French uniforms, those who had joined the Foreign Legion or escaped to England after the defeat of France in 1940. These men had battled General Erwin Rommel’s Afrika Korps and had then prepared for the invasion of France. They were to return to France in mid-1944, help to liberate it from the Nazi army, and then to push into the heartland of Germany itself. In the summer of 1943, sixteen thousand soldiers, twenty percent of them Spaniards, were activated in Africa as the Second French Armored Division, under the command of General Philippe Leclerc. They were drawn from diverse sources but all had seen considerable action in the African campaigns. Equipped by the Americans, the division possessed the most modern armor. At about the same time General Brosset assumed command of the First French Armored Division and General Jean de Lattre de Tassigny was named commander of the French Army B.1 These units were to become the visible symbols of the resurgence of French military vitality and the instruments through which France would rejoin the contest against Hitler. 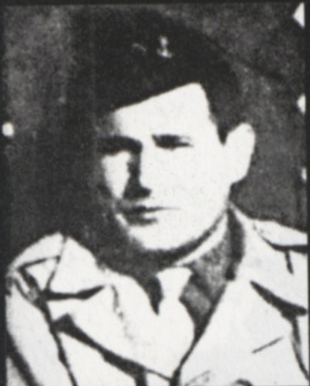 Staff Sergeant Miguel Campos, leader of La Nueve’s’ ‘Third Section’, who recruited a secret section of Spanish anarchist defectors from the Foreign Legion. Campos disappeared during a solo mission in December 1944 and was never seen or heard of again. The Ninth Company was active in many parts of Paris on August 25th. The Germans had set up a number of strongpoints, and fighting went on sporadically until General von Choltitz signed the surrender. 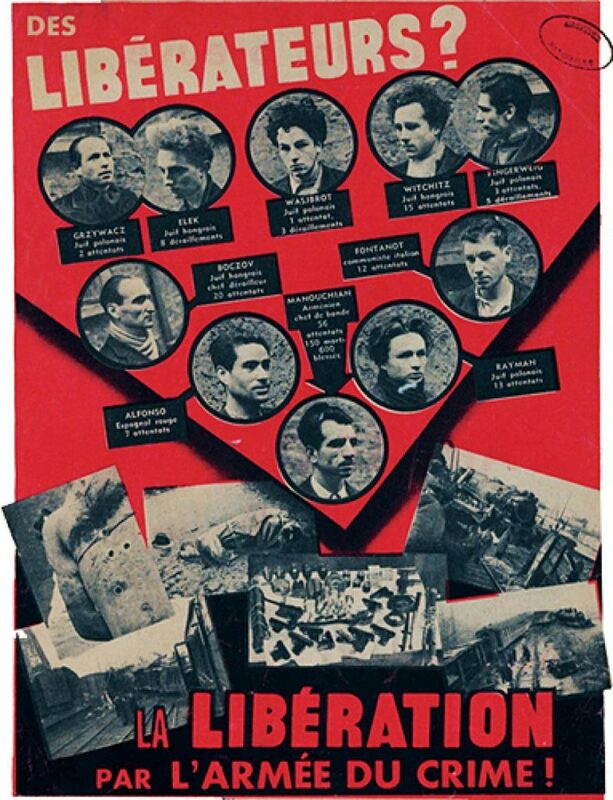 One battle may have ended, but another began as General de Gaulle’s forces and the communist-led portion of the Resistance movement jockeyed for control of the city. Another engagement, perhaps not as important, but indicative of the American attitude toward General de Gaulle, took place when General Gerow issued a general order to Leclerc forbidding the French Second Armored Division from marching in the victory parade down the Champs-Elysées, scheduled for August 26th. Operating, as you are, under my direct command, you will accept no orders emanating from any other source. I believe you have received orders from General de Gaulle for your troops to take part in a parade this afternoon at 1400 hours. You will pay no heed to this order and you will continue to carry out the mission to which you are at present assigned to clean up all resistance in Paris and its neighborhood, within your zone of action. The troops under your command will take no part in the parade, either this afternoon, or at any other time, except on orders personally signed by me. The Leclerc Division—the Second French Armored—remained in Paris from August 24 to September 8, when it resumed its march to the east. 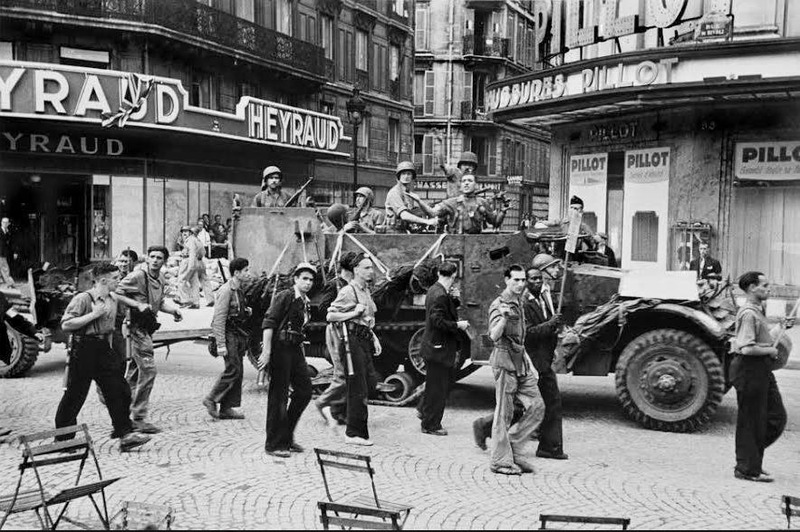 When it left the capital it contained six clandestine Spanish members, whose mission looked beyond the defeat of Germany to the eventual return to Spain: in the first hours of liberation, six former members of the anarchist Durruti Division who were in the Paris Resistance had met some of their former comrades who were now with the Ninth Company. Sergeant Campos, a section leader, proposed to Joaquin Blesa and five comrades that they join the unit clandestinely, with the objective of recovering arms and ammunition from the battlefields and hiding them for future use in Spain. On May 8, 1945, V-E Day, the war in Europe ended. The Spanish republicans had fought the Germans since 1936 in Spain and Africa and on the western and eastern fronts of Europe. They had fought too for the right to gain Allied support in the liberation of their homeland. Thousands were already anticipating a campaign in Spain, and the guerrilla war there had never really ceased. It was hoped that the new United Nations Organization would throw its weight behind the effort to re-establish the Spanish republic. Pons Prades, p. 362; Vilanova, pp. 371-372; Aron, p. 309. Raymond Dronne, Le Serment de Kouffra (Paris: Editions du Temps, 1965), quoted by Vilanova, pp. 372-373; Pons Prades, p. 415, quotes Federico Moreno, a member of the Ninth Company, on the figures concerning the original complement and survivors of the campaign, from a letter written by Moreno on July 7, 1974. Captain Raymond Dronne, quoted by Vilanova, p. 424. Robert Aron skirts the issue of disobedience of American orders at this juncture. He does not mention the role of General Gerow and says merely that General Leclerc, on August 23, “received the orders to march on Paris for which he had been waiting for four years”; Aron, France Reborn, p. 257. See also Pons Prades, pp. 388-389; Angel, pp. 190-192. Captain Raymond Dronne, quoted by Vilanova, pp. 426-428; Pons Prades, p. 389; Angel, pp. 191-192. Dronne, quoted by Vilanova, pp. 426-427; Pons Prades, p. 389; R. Aron, pp. 257, 284; Adrien Dansette, Histoire de la Liberation de Paris (Paris: F. Brouty, J. Fayard, 1947), pp. 350, 354. Dronne, quoted by Vilanova, pp. 428-430. Leo Hamon, quoted by Pons Prades, p. 390. Jesus Abenza, in Montseny, p. 236. V Echegaray, another tankist, wrote in Montseny, p. 242, that two French tanks rolled up to the City Hall after the first Spaniards had arrived. He also noted that the first FFI men who greeted Dronne’s force mistook them for Americans or Englishmen and had to be informed of their nationality. Marie Granet, Le Journal “Defense de la France” (Paris: Presses Universitaires de France, 1961), p. 244. Angel, pp. 66-68, 70-71, 178-182; Pons Prades, pp. 276-279; report from Securité Militaire d’Alger to Office of Strategic Services, marked SECRET 38267, May 26, 1943, National Archives, Washington, D.C.
R. Aron, France Reborn, p. 298. Vilanova, p. 281; Dansette, p. 329. Joaquin Blesa, in Pons Prades, pp. 408-410. General order no. 66, October 31, 1944, headquarters of Second French Armored Division, quoted in Pons Prades, p. 401; decision note no. 374, official diary, November 11, 1945. 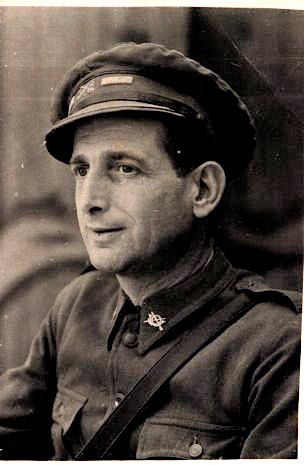 The citation noted that on November 17, 1944, Moreno had again assumed command at a critical moment and led his unit to victory over a numerically superior force, in Pons Prades, p. 403. V Echegaray, in Montseny, p. 243. 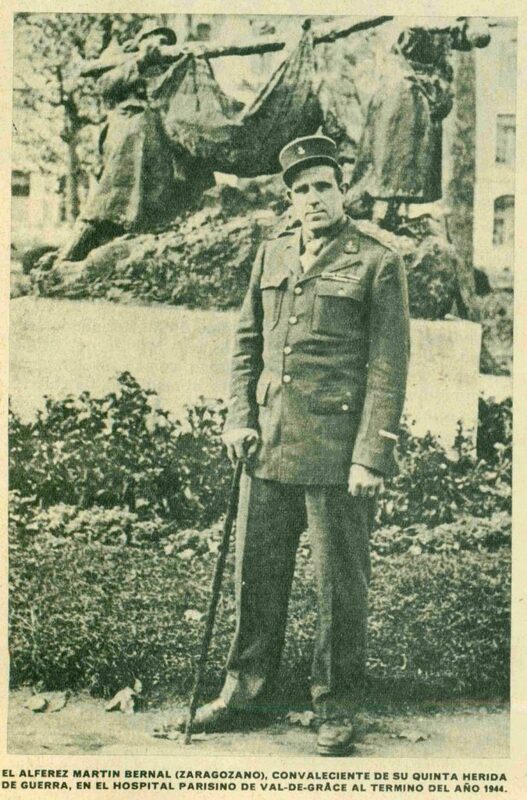 Echgaray was wounded on November 12, 1944, terminating his participation in the war. Ibid., pp. 412-414. After the reduction of the Atlantic ports the two tank regiments rejoined the Second Armored Division and completed the dash across Germany. Ibid., pp. 498-499; Murillo de la Cruz, in Montseny, pp. 230-233; Vilanova, pp. 355-356. Colonel Paul de Langlade, En Suivant Leclerc (Paris, 1964), p. 383, quoted by Vilanova, pp. 305-306. R. Aron, France Reborn, pp. 430-436. Aron puts the number of Germans in the Atlantic pockets at 69,000. Vilanova, pp. 305-306. R. Aron, in his discussion of this campaign, in France Reborn, pp. 430-436, does not mention the Spaniards. ‘OPERATION DULCINEA’ The Hijacking of the SS Santa Maria, 21 January— 2 February 1961.